Reset oil service light Pontiac Bonneville tenth generation. From years: 2000, 2001, 2002, 2003, 2004, 2005. How to reset oil service light Pontiac Bonneville tenth generation. The Engine Oil Life System calculates when to change your engine oil and filter based on vehicle use. Anytime your oil is changed, reset the system so it can calculate when the next oil change is required. If a situation occurs where you change your oil prior to an ENGINE OIL CHANGE SOON DIC message being turned on, reset the system. Switch the ignition to run/on position, don’t start the car. Display the oil life warning light index on the Driver Information Centre (DIC). Push & hold the RESET button for more than 6 seconds. Switch the ignition off and then start the car to verify the oil maintenance indicator has been reset. All information how to reset oil service light Pontiac Bonneville tenth generation is taken owner’s manual. Engine Oil Life System Pontiac Bonneville tenth generation. Press the SELECT button until OIL LIFE appears in the display. The OIL LIFE NORMAL display will show an estimate of the oil’s remaining useful life. When the oil life index is less than 10%, an ENGINE OIL CHANGE SOON message will be displayed and the oil life display will show OIL LIFE CHANGE. 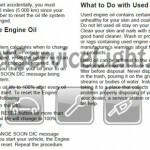 When the ENGINE OIL CHANGE SOON message is displayed, it means that service is required for your vehicle. 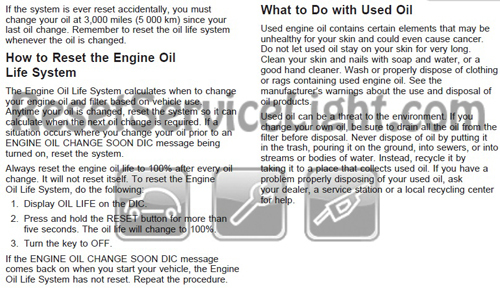 When you have the oil changed according to the maintenance schedule, you will have to reset the engine oil life system. See above the full procedure how can you See above. Most trips are less than 5 miles (8 km). This is particularly important when outside temperatures are below freezing. Most trips include extensive idling, such as frequent driving in stop-and-go traffic. The vehicle is used for delivery service, police, taxi, or other commercial application. Driving under these conditions causes engine oil to break down sooner. If any one of these is true for your vehicle, then you need to change your oil and filter every 3,000 miles (5 000 km) or 3 months — whichever occurs first. If none of them is true, use the long trip/highway maintenance schedule. Change the oil and filter every 7,500 miles (12 500 km) or 12 months — whichever occurs first. Driving a vehicle with a fully warmed engine under highway conditions will cause engine oil to break down slower. If your vehicle has the Engine Oil Life System, see Engine Oil Life System lower for information on when to change your engine oil. Engine Oil Life System Pontiac Bonneville tenth generation. When to Change Engine Oil. If your vehicle has the Engine Oil Life System, it has a computer system that lets you know when to change the engine oil and filter. This is based on engine revolutions and engine temperature and not on mileage. Based on driving conditions, the mileage at which an oil change will be indicated can vary considerably. For the oil life system to work properly, you must reset the system every time the oil is changed. To see how to reset oil service light Pontiac Bonneville tenth generation see the information above. When the system has calculated that oil life has been diminished, it will indicate that an oil change is necessary. An ENGINE OIL CHANGE SOON DIC message will come on. See DIC Warnings and Messages on page 3-62. Change your oil as soon as possible within the next 600 miles (1 000 km). It is possible that, if you are driving under the best conditions, the oil life system may not indicate that an oil change is necessary for over a year. However, your engine oil and filter must be changed at least once a year and at this time the system must be reset. It is also important to check your oil regularly and keep it at the proper level. That it is the full procedure how to reset oil service light Pontiac Bonneville tenth generation. If you like to reset any maintenance oil light after an oil change. Or reset check engine light, airbag light, inspection key or insp errors when maint reqd, for Pontiac cars. Or any warning light for service reminder which appears on the display. Write in the search box the car name for which you want to find information, and find how to reset other service reminders by yourself.